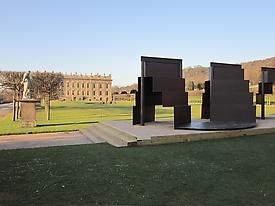 The Chatsworth House Trust and the New Art Centre, Roche Court Sculpture Park, are proud to present 'Caro at Chatsworth'. This will be the first exhibition dedicated to the work of a single artist to be held in the garden at Chatsworth and will comprise 15 sculptures by Sir Anthony Caro sited around the famous Emperor Fountain, in front of the south façade at Chatsworth. 'Caro at Chatsworth' provides a once in a lifetime chance to see the larger work of Britain's greatest living sculptor in one of Britain's most famous historic settings.